Here's a KoF style reference. 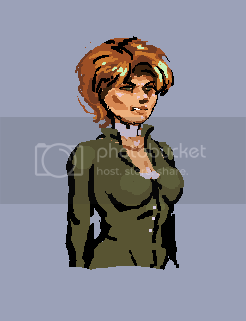 Might be handy to look at the proportions of something like this, rather than real proportions, since this seems to be the style you're going for. Pixel herding is hard work. Are her breasts supposed to be bound, in lieu of her wearing a sports bra? If so, they're really, really round for that; compression-style jiggle controlling bras/bindings flatten the breasts and spread them out quite a bit more than that. Usually the cleavage won't be of the straight-line, sort - more of a soft hills kind of cleavage if anything. Very few well-fitting bras will give the sort of cleavage you've got going on here. They should feel more uplifted and supported, as well - right now, it looks like her binding is *really, really loose* because of how low the breasts are sitting. Those things will flop all over and *hurt* when you're trying to be athletic. A compression-based sports bra/binding will push a lot of the breast tissue up and nearer the body, giving it way less projection. And in an encapsulation-based bra, the breasts are separated and lifted, not pushed together to create line cleavage. It's supposed to be a bandage, not a bra, if that helps. I assume it's meant to bind her breasts as a bra might, however? Unless she's going without any support at all? I was starting to go somewhere with this but I ran out of time unfortunately. Oh yeah I forgot the eye bandage Anyway, your portrait has a few proportion issues. Chest too far down. Neck too long. Upper arm too long. Why'd you try to draw the individual nostrils at that resolution? The colors are really plain too. I didn't change them much in my edit but someone else might have the time. I'm really impressed with your animating ability BTW. Especially for such a large sprite. What tools do you use for animation if you don't mind my asking? Quite a late reply, but I've ben busy lately. I retouched the hair a bit. Here's how it looks on the portrait and the idle sprite. Does it look any good? I didn't attempt to resolve the bra issue, ha, I don't think I quite get how to solve it. As for the animation process, now I draw keyframes, then rotate inbetweens with rotsprite and then edit them to clean them up. I only rotate when I've finished the keyframes (color, lines, etc), before I stupidly rotated unfinished frames and had to do a lot more work. Right now I'm doing the lines for the last two enemies I want to have for testing and demoing. After that I'll have to do at least a part of a stage, which will be a new thing for me since I've never drawn stages. I'll probably end up having to hire help for that eventually with some crowdfunding campaign, as it will be a lot of work for a single man.